In this post, we will discuss how we can get the Tenant Id for SharePoint Online site in Office 365. By using PowerShell as well as from browser, we will be able to get the Tenant Id. The other way is Open your SharePoint Online site, then Navigate to Settings -> Site settings. Then under Site Collection Administration click on Site collection app permissions. There you will be able to see your app display name as well as app identifier. In the App Identifier whatever presented after @ is the Tenant Id. See fig for reference. If you have not added any app on the site, you can try adding any free or trial app from the office store. 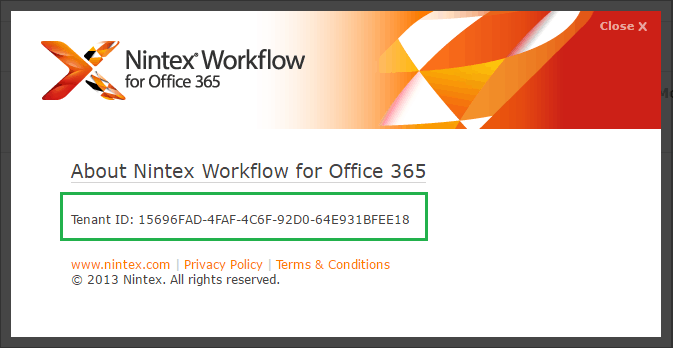 One of the other easiest ways to get the tenant id is from Nintex Workflow for Office 365. The best part is you can add a 1-month free version of Nintex Workflow for Office 365 to your online site. From the gear icon you can click on Add an App and then from SharePoint App store you can search for “Nintex Workflow For Office 365” and then you can add the app.